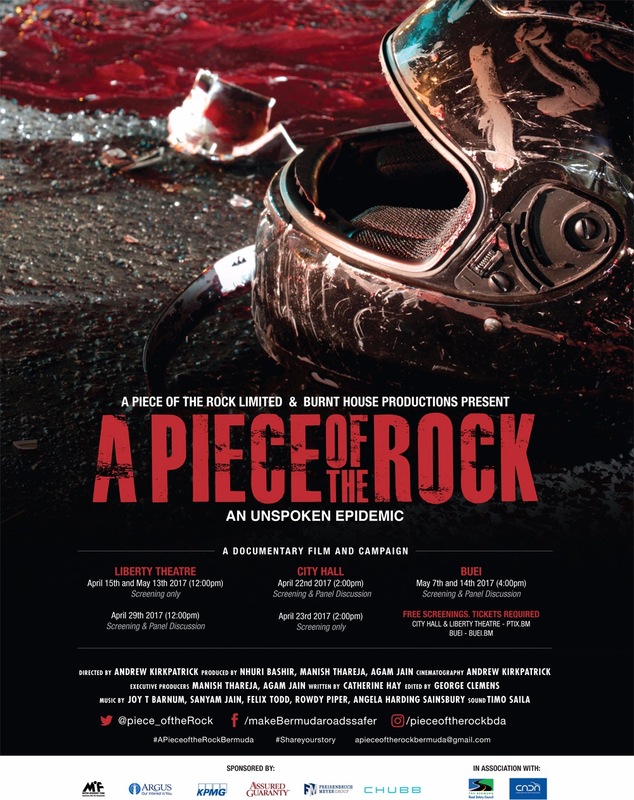 A Piece Of The Rock, an independent road safety campaign run by a coalition of concerned island residents, announced seven public screening dates for its full length documentary, running throughout April and May. The hour length documentary, shot by local filmmakers Burnt House Productions, will launch with a kickoff screening at Liberty Theatre this Saturday [April 15] at noon. Saturday, April 22 – City Hall Screening and Panel Discussion at 2pm. Sunday, April 23 – City Hall Screening Only at 2pm. Saturday, April 29 – Liberty Theatre Screening and Panel Discussion at 12pm [noon]. Sunday, May 7 – Bermuda Underwater Exploration Institute [BUEI] Screening & Panel Discussion at 4pm. Saturday, May 13 – Liberty Theatre Screening Only at 12pm [noon]. Sunday, May 14 – Bermuda Underwater Exploration Institute [BUEI] Screening & Panel Discussion at 4pm. All events are free to the public, however tickets must be reserved in advance on www.ptix.bm and BUEI.bm [for BUEI screenings only]. Producer Agam Jain said support so far has been tremendous, with advocates from a wide-cross section of the community, including healthcare professionals, members of judiciary, police force, politicians and everyday citizens coming on board to help. The road safety campaign is also being run in collaboration with the Road Safety Council and CADA. “It’s been an incredible community effort so far,” Mr Jain explained. “We hope that support continues as we show the film at multiple locations over the next six weeks. In our opinion, showing it just once on the big screen wouldn’t be enough in terms of the wide reach we’d like this film and campaign to have. The idea for the documentary was sparked back in 2015. Both Mr Jain and co-producer Manish Thareja lost people close to them due to bike crashes. They noticed how frequently people were dying on the roads in Bermuda – and decided to get involved. “Without their amazing support, this documentary just wouldn’t have been possible,” Mr Jain said. The team thanked their various sponsors, which include local companies, foundations and individuals. The objective of the documentary is two-fold: to raise cultural awareness of the dangers and potentially life-threatening consequences of reckless driving on our roads, and encourage legislative change and enforcement so more lives aren’t lost. According to statistics, the hospital costs alone from these road traffic injuries have been $43 million between 2009 -2015, and that doesn’t include the costs from overseas outpatient care, rehab costs which are also in the millions. The leading cause of road traffic injuries is speed and driving under the influence of alcohol or other drugs. Driving under the influence of alcohol or drugs, has been attributed to 70% of road fatalities since 2000 and is still largely culturally acceptable on the island. A Piece of the Rock documentary will explore these issues, as well as other problems plaguing the island’s motorists and what needs to be done to solve them. The film is being produced by A Piece of the Rock Limited, a not for profit company limited by guarantee. For more information visit Facebook: A Piece of the Rock. Reserve your tickets to the screening of your choice at www.ptix.bm. For those that won’t be in Bermuda during the screenings, will the documentary be posted online for overseas Bermudians to watch? I couldn’t imagine supporting this and reliving the horrifying details of a family member’s death all over again. With respect, shouldn’t that make you support and promote this all the more? The idea is that by people sharing tragedies, it puts a face to it, brings it home and will hopefully make others think about their actions when on the road potentially saving lives and lowering our horrendous per capita numbers. This has been tried before . Island mentality isn’t swayed by gory and graphic documentaries . Some years back there was a very hard hitting and graphic documentary of the kid who took a bike , modified it and then tried to mix up his own version of rocket fuel . He got in a chase with the police and crashed and the bike exploded . He died on the operating table more than once and his appearance was changed for life . The documentary was well promoted and advertised for weeks in advance and no doubt viewed by a very large audience. The next day everyone was driving in their usual out of control manner like nothing had ever happened . To all the riders riding into town every morning ganged up at Paget stoplights on both sides like a race is about to take place. Maybe you should all watch this and realize one day that car coming at you might not be paying attention and run all of you down. All it takes is one person texting. Think twice before you block the rd. This might help you wake up and make you realize that we are only human and the “it won’t happen to me” phase eventually burns out.